The Dolley Madison Garden Club works alongside the Garden Club of America and the Garden Club of Virginia to promote responsible environmental stewardship and to aid in efforts to "restore, improve, and protect the quality of the environment" through engagement with the community and with legislators. Years of work by the Garden Club of America and its member clubs, including the Dolley Madison Garden Club, and many partners have succeeded in helping achieve a bipartisan piece of legislation that permanently continues the Land and Water Conservation Fund. The fund was created in 1965 to set aside monies to be used to mitigate damages from Energy and Mining companies extracting resources from Federal publicly owned lands, seashores and National Parks, and to acquire new public lands. Its permanent continuation ensures that monies will continue to be put into the fund and those monies used for mitigation and acquisition. This bipartisan piece of legislation has been called " the biggest piece of conservation legislation since the 1970's." This has been a great season for Monarch reproduction, but be careful: many Monarchs still have Chrysalis in progress on your plant material. Give it a few more weeks before you begin garden clean-up. Take a moment, take a breath, and think about all the insects and wildlife that depend on what we consider “garden debris” to make it through the winter. Most current Landscape Architects and Garden Designers encourage leaving as much spent material standing as possible throughout the winter months to provide cover and food sources for over-wintering insect and bird populations. Try to train your eye to see the architectural beauty of skeletal forms of tall perennials like echinacea and rudbeckia, and leave their seed heads intact for nuthatches, finches and mockingbirds to survive the winter months. Commercial seed is too limited and nutritionally empty to support them through the winter. So you’re not being lazy - you are doing a very important good to provide essential species survival! Courtesy of Dan Gregg, Founder of Grelen Nursery, Inc.
What is Boxwood Blight? First introduced to the United States in 2011, Boxwood blight (Cylindrocladium pseudonaviculatum) is a serious plant disease (fungus) which results in the defoliation and eventual death of exposed plants. Plants affected by this fungus are all in the Buxaceae family including Buxus (Boxwood), Sarcococca (Sweet Box) and Pachysandra. How does Boxwood Blight spread? The disease spreads via fungal spores which move from place to place during wet conditions with the assistance from strong wind, animals (both wild and domestic), lawn care equipment, landscaping equipment and pruning equipment. Basically anything which comes into contact with an infected plant during wet conditions is likely to have spores attach to it, and hence, potentially introduce the spores to new host plants in its path. Why do you need to know about Boxwood Blight? Boxwood Blight has recently exploded in the Central Virginia region due to the very wet conditions we have experienced this summer and fall. Boxwood Blight is currently devastating landscapes in neighborhoods of Lynchburg and Charlottesville, and we expect other neighborhoods will be impacted in the coming weeks. What can you do? If you have Boxwood in your yard and gardens - Reach out to the local Virginia Cooperative Extension Service and ask if any Boxwood Blight cases have been confirmed in your local vicinity; Inspect your property to see if you have plants which appear to be infected (see photos below). If you determine that you may have infected plants, call the Virginia Cooperative Extension Service to confirm diagnosis; If you see no sign of the disease but the VA Cooperative Extension Service confirms that you have Boxwood Blight in your area, start a preventative spray program immediately using a local plant health care specialist; If Boxwood Blight is confirmed to be on your property, hire a qualified company to remove infected plants and spray to reduce risk of the disease’s spread. DO NOT ALLOW UNQUALIFIED INDIVIDUAL OR COMPANY TO REMOVE PLANTS AS YOU WILL BE RISKING YOUR PROPERTY AND NEIGHBORING PROPERTIES TO THE ADDITIONAL SPREAD OF THE DISEASE.Pruning and hauling infected limbs without proper bagging and disposal will increase the risk of spread; Finally, going forward LIMIT ACCESS your property to lawn, landscape and pruning companies who are very familiar with Boxwood Blight and are knowledgeable as to how to prevent the spread of the disease. Spotted Knapweed , a non- toxic invasive plant, has been sighted in Orange County. It is an invasive biennial in the aster family that is commonly found along farm lanes, woodland roads, and fields. It releases a toxin that prevents other nearby plants from growing and impairs native flora. Removing this plant before seeding is crucial. This plant may be pulled or weed whacked while flowering but before seed sets. Xerces Societies’ Mace Vaughan says if you do one thing to save the diminishing Monarch butterflies, start buying only shade grown coffee. Acres of Monarch habitat is lost yearly due to clearing for coffee plantations. Traditionally the best coffee is shade grown. If you look for the label and buy only shade grown coffee, you can save monarchs and help preserve traditional lands for indigenous peoples. Americans are the bean’s largest consumers! 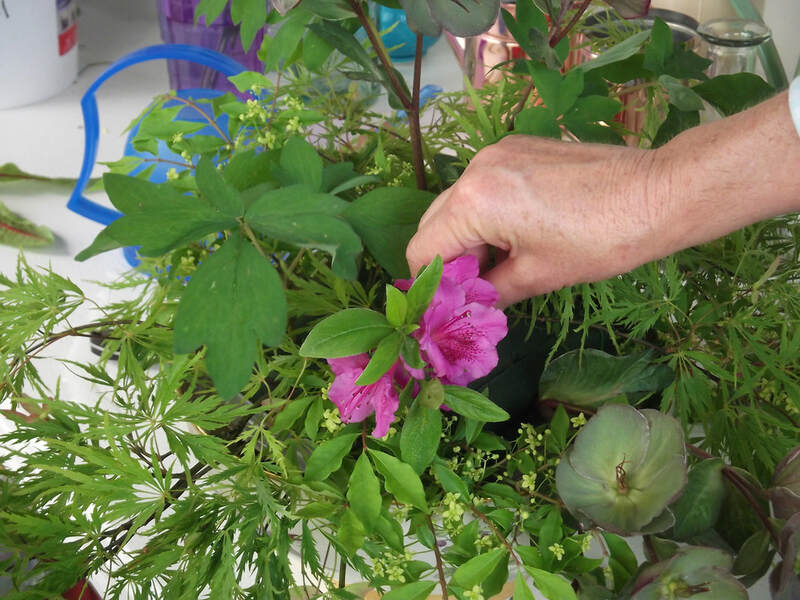 The take-away from this year's Shenandoah Valley Plant Symposium is to rethink how you garden. Claudia West, author of “Gardening in the Post Wild World” and Larry Weaner, celebrated landscape architect, encouraged every home gardener to consider wildlife and the insect world when designing a landscape. They urged gardeners to :reduce lawn size, leave fields natural for habitat; plant for low-maintenance, mostly native plants which require less water and no soil amendments or fertilizer; choose plants with similar needs for the same area, for example drought tolerant catmint and rudbeckia; plant densely to preserve moisture and suppress weeds, use ground cover plants instead of mulch; and plant native shrubs, berries and trees to provide food and cover for pollinators and wildlife. And you can learn more by reading Larry Weaner’s new book Garden Revolution available on Amazon. Neonicotinoids (or neonics) are insecticides that use neuro-active ingredients to affect the central nervous system of insects to cause death. Neonics include acetamiprid, clothianidin, imadacloprid (one of the most widely used of the neonics), nitenpyram, nithiazine, thiacloprid, and thiamethoam. The most comprehensive study to date of the impact of neonics, completed this year in Europe, concluded that neonicotinoids are devastating to both honeybee and native bee populations. Neonics can be found in seeds and plants sold at many stores and gardening centers and in many products, including non-organic products used to treat roses. Neonic residues can persist in plants and soil for up to six years and are poisonous to pollinators that are essential to our ecosystem and economy. Some pollinators, like the monarch caterpillar, may die after only two or three bites of neonicotinoid treated plant. Garden Club of America Calls For Action to Restrict Neonicotinoids. ​On May 5th, 2017, the GCA’s executive board asked the Secretary of the Department of Agriculture to restrict neonicotinoid use in the US. The letter stressed the importance of pollinators and their role in society. GCA, concerned that consumers lack awareness of the impact of neonics on pollinators and neonic residues in plants they purchase, called on the U.S. Department of Agriculture to take action to regulate neonics. The goal is to stop plant distributors from using neonicotinoids, or at a minimum, to require labeling if neonics have been used to treat a plant so that a buyer can make an informed decision. University of Florida research shows that landscape shrubs just need 1 gallon of water per week to establish strong roots and a healthy plant. It takes about 28 weeks before a shrub or woody perennial is mature enough to survive without irrigation. The UF study concluded that no more than 1 gallon of water per week is necessary to establish strong roots and a healthy plant. Any more water simply becomes run-off and does not benefit the plant. Both native and non-native species were included in the study. Interestingly, native status made no difference in the amount of water needed for establishment. And the study showed that more frequent, lighter watering was actually better for the establishment phase then the deep infrequent watering traditionally recommended. You can take steps every day to use water wisely. Fixing leaks in plumbing is an easy step. Running full loads of laundry and dishes will save on water usage. Shortening shower time and turning off the faucet while you brush teeth add up in savings every day. Outside, plant with garden, border, and vegetable plants that use minimal water. Think about planting bigger borders and decreasing the amount of lawn around your home. If you do have to water your plants, using soaker hoses and watering in the morning or evening will minimize water usage and reach your plant roots more efficiently. ​Planning guides, plant materials and tips for better maintenance to garden for sustainability and wildlife as we face the challenges of a changing climate and landscape. “Growing a Greener World”, Saturday mornings at 8:00 am on PBS. Host Joe Lampl visits great gardens and landscapes showcasing cutting edge green techniques like commercial rooftop gardens and public gardens reclaiming former industrial spaces. Each year Garden Club of America affiliate members from every state in the U.S. come to the Nation’s Capitol for a three day crash course in advocacy on conservation issues, followed by a strategic planning session. The session culminates in private meetings with Senators and Congressmen. This year's featured speakers included former Secretary of Treasury Hank Paulsen, author and entomologist Doug Tallamy, and Secretary of Transportation Elaine Chao. A recurrent theme was the devastating effect of Climate Change on the Economy. Both Paulsen and British International Financier Robert Grantham (called “Advisor to the Crown”) warned of threats to global markets, an impending world-wide water crisis and mass migrations as a result of increasingly severe weather events and droughts. The 3 day event ended with a moving presentation by Audubon Societies’ Scott Weidensaul on migratory birds.